LAS VEGAS -- American Floyd ”Money” Mayweather Jr.’s 12-round bout against Mexican Champion Saul “Canelo” Alvarez scheduled on September 14, 2013 at MGM Grand Garden Arena in Las Vegas, Nevada in a catch weight of 152 pounds is so huge, significant and historic that it is difficult for any sportswriter to sum it up in few words. At stake is the undefeated record of each boxing warrior. Mayweather is undefeated in 44 wins with 26 knockouts while Alvarez has an unblemished record of 42 wins with 30 knockouts and 1 draw. Also at stake are the WBA Super World Light Middleweight and WBC Light Middleweight or Super Welterweight World Championship titles. How colossal “THE ONE” is? Gate tickets amounting to $20 million were sold out within hours that they went on sale in June, three months before the fight. 6 MGM Resort properties, ARIA, MGM Grand, Mandalay Bay, The Mirage, Monte Carlo and New York-New York will host live closed circuit telecasts of “THE ONE” for $100 each patron, not including handling fees that will accommodate 26,000 boxing fans not including those in bars and restaurants all over the country. Also, 547 select movie theaters across the country will be showing “THE ONE” akin to watching the fight up close in front row seats for $20-$25 charge to each patron. Lastly, Pay Per View are expected to be in millions in sales all over America and the rest of the world. Richard Shaefer said, "In Australia, the pay per view has already broken all-time records with three days before fight night. This fight has been off the charts. This fight is something special. Celebrities are calling us to purchase tickets. We hope to set the all-time pay-per-view record come Saturday night." Floyd “Money” Mayweather is really worth its moniker. Saul “Canelo” Alvarez is just lurking discreetly quietly aiming for the stars. Today’s media pre-fight press conference held at KA Theater inside MGM Grand Hotel and Casino lacked the excitement, the noise and the intimidation usually present in previous big fights which is the last push of promoting any fight be it in boxing or in mixed martial arts. There is no need for it as Mayweather and Alvarez are already an institution and a legend in their own rights. Money has the backing of his usual fans while Canelo has the whole Mexico and all Mexicans all over the world. Not to mention that the fight will be held on the Mexican Independence day weekend. There was no trash talk either. Canelo said, "I think it's because his other opponents want to talk trash. I respect everyone except when we get in the ring." Everyone on the stage was all business and civil from the trainers to the fighters in contrast to the explosion and the excitement expected on fight night. Everyone from Richard Shaefer, the CEO of Golden Promotions and Leonard Ellerbe, the CEO OF Mayweather Promotions, to the trainers and the fighters all expressed their appreciation to the sponsors and partners that made this boxing mega event a success and one that will stick to memory in a long time. Corona is the lead sponsor while Fathom takes care of the movie theater business. The highlight of the press conference was when Mauricio Sulaiman, WBC Director, on behalf of his father, Jose Sulaiman, WBC President, presented to the media and to each fighter the championship belt made of pure gold and Italian leather. It was designed by a Mexican artisan and bears Mexico Tourism logo which will mark the winner as a Mexican ambassador throughout the whole world. This fight is promoted by Mayweather Promotions, Golden Boy Promotions and Canelo Promotions. Other sponsors are O’Reilly Auto Parts, AT&T, Valvoline, Mexico Tourism, Fred Loya Insurance and Nature Nutrition. “THE ONE” is produced and televised live by Showtime PPV beginning 9:00 p.m. ET/6:00 p.m. PT. The third man on the ring is Kenny Bayless and the fight’s judges are Dave Moretti, C.J. Ross and Craig Metcalfe. 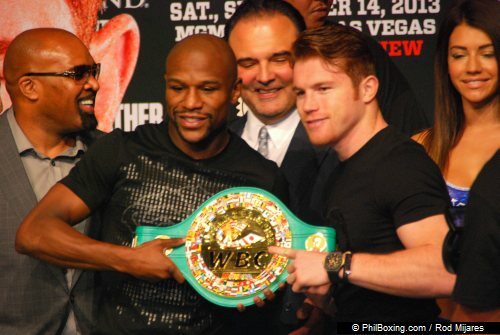 "THE ONE" Protagonists, Saul Alvarez and Floyd Mayweather, Jr. hold the WBC Championship belt made of pure gold and Italian leather. 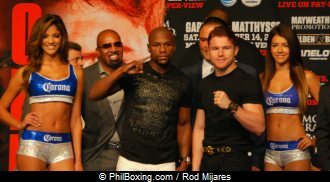 Richard Shaefer, Golden Boy Promotions CEO and Leonard Ellerbe, Mayweather Promotions CEO pose behind Mayweather and Alvarez at the Media Pre-Fight Press Conference at KA Theater on September 11, 2013 at MGM Grand Hotel & Casino in Las Vegas. Photo by Rod Mijares.